Please go to our Book Catalog to order multiple titles! 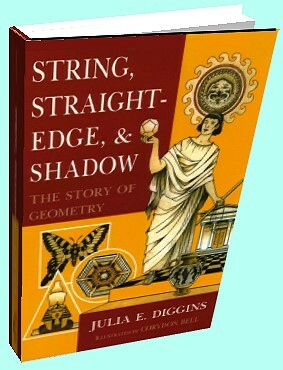 Whole Spirit Press is pleased to bring "String, Straightedge and Shadow The Story of Geometry" by Julia E. Diggins back to life for teachers, parents and students to once again enjoy. This is an excellent classroom reader for all students as they learn about geometry. It has been out-of-print for 34 years. $16.95 per copy up to 9. $13.50 per copy for 10 or more. Students and teachers have used photo copies rather then being able to experience the beautiful illustrations by Corydon Bell and have their own copy to refer to and cherish throughout the years. Using only three simple tools-the string, the straightedge, and the shadow-men discovered the basic principles and constructions of elementary geometry more than two thousand years ago. This engrossing book reveals how these discoveries were made and shows how they were related to the early civilizations of Mesopotamia, Egypt and Greece. The fabric of the story is woven out of archeological and historical records and of legends about the major men of mathematics. By re constructing the events as they might have happened, Julia Diggins enables an attentive reader to easily follow the pattern of reasoning that leads to an ingenious proof of the Pythagorean theorem, an appreciation of the significance of the golden mean in art and architecture, and the construction of the five regular solids. See excerpts of this book. All Material Copyright by Whole Spirit Press. Website design and hosting by SSNet, Inc.